"This is a recipe my mom came up with when we were snowed in. Serve it hot or cold. 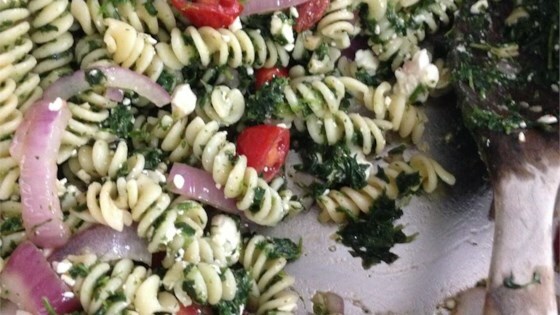 Use flavored feta to add some extra seasoning to your dish." Bring a large pot of lightly salted water to a boil. Add pasta and cook for 8 to 10 minutes or until al dente; drain and reserve. Meanwhile, in a medium saucepan over medium heat, bring water to a boil. Add spinach and cook for 5 minutes or until spinach is tender; drain and reserve. In a large pot over medium heat, warm olive oil and saute garlic until golden; add pasta and spinach and mix. Remove from heat and let cool for ten minutes. Add feta and dill; mix well and serve. I loved this recipe and it was so quick and easy to make! I added pignoli nuts and a little extra olive oil. good & simple...but, I found myself adding all kinds of seasonings afterwads to make it more flavorfull. Overall, something I'd make again in a hurry for company!